THIS EVENT HAS BEEN CANCELLED. 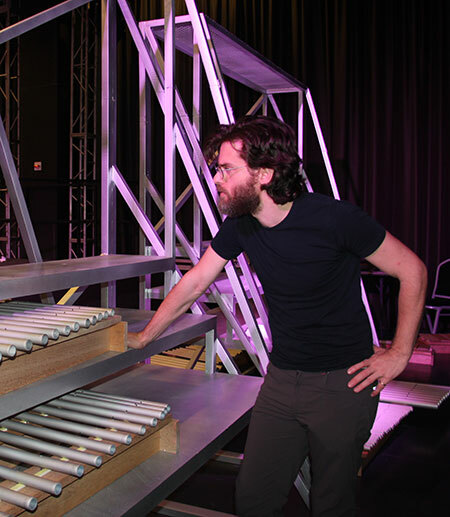 Eli Marshall, composer, moved to China from the USA in 2003 on a Fulbright Fellowship, affiliating with the China Music Research Institute and researching contemporary music while embarking on a freelance music career in dynamic pre-Olympics Beijing. Since then, many of his creative projects have focused on international collaboration and artistic exchange. His orchestral works have been premiered by orchestras in mainland China, Hong Kong, and Macao, as well as Germany, Ireland, Ukraine, and Sweden; and other musical premieres at the German Parliament, South Korea’s Gak-won Sa, and in 2005 at the Smithsonian Institution, where his commissioned music was featured for six months as part of Mei-ling Hom’s installation (recorded by dizi virtuoso Tang Junqiao). His composition Unde Pendet Aeternitas, for voice and orchestra, was premiered by Warren Mok, tenor, and the Macao Orchestra, and won the 2007 Kaplan award from the American Society of Composers, Authors, and Publishers (ASCAP). He is co-founder of and, from 2005-10, was artistic director of, the Beijing New Music Ensemble, which premiered numerous works of contemporary music; the group was featured in a BBC Music concert broadcast in 2008 and, working closely with composers Chen Yi and Zhou Long, released an album on the Naxos label in 2009. In 2013, he curated a concert series in collaboration with the Ullens Center for Contemporary Art in Beijing’s 798 art district. His original music score for Ann Hui’s The Golden Era (2014) featured Wu Tong as sheng soloist with the London Symphony Orchestra. He also contributed music to Wu Tong’s own score for Wong Kar-wai’s Ashes of Time — Redux (2009); the soundtrack to the latter, featuring Yoyo Ma, was released on the Sony Classical label; concert suite arrangements were performed by the Hong Kong Philharmonic and the Shanghai Philharmonic (the latter conducted by the composer in 2016). He studied music at Bard College, the Yale School of Music, the Curtis Institute, Germany’s Hamburg Hochschule fur Musik und Theater, and the Chinese University of Hong Kong. He has taught at the Central Conservatory of Music (Beijing), Witten/Herdecke University (Germany), and was Visiting Scholar and Composer-in-residence at the Hong Kong University of Science and Technology. Currently, he is Postdoctoral Associate and Visiting Faculty at Cornell University in Ithaca, New York.